At the beginning of october I participated at the Big Data Conference, organized by "bigstep" in London - in the context of the world wide Bg Data Week. I was there to learn if AI could be useful in the context of the goals of Sci4D (http://www.sci4d.org). From today on I will not use Facebook anymore to publish originary content. I will reopen my blog at johanneskeizer.com, which I stopped in 2013. I want to be able to manage my pictures, thoughts and news as I like, I want to maintain control. I don't want to give this control to Facebook. I did not publish since 2012 on this site and went the easy way of throwing sentences into facebook. It's wrong. We don't need monopolies on the web! I am normally frontrunner regarding ICT innovations. When I moved in 86 from Germany to Italy, I already came with my PC, well PC, it was more a typewrite with screen. When Internet came ppublic, can't remember the year, I had one of the first accounts. I still remember the emotion when after painstaking attempts finally the modem brought you into connection. I remember Mosaic. I programmed one of the first data driven ASP applications at FAO. I have cabled our flat and we have 4 internet connected PCs for three inhabitants :-). Read more about Old Fashioned? After quite some time johannes.keizer.com is online again. (Grazie Antonella!!). I was telling in my offline message that the side had been hacked. Well, this was exaggerated. First I had discovered that links behing pictures had been changed, then I found strange words in my vocabularies. I opened the site as "anonymous user" and found that all public posts could not only be viewed, but also be edited. I was horror-stricken and thought about a severe hacking. I put the site offline. I did not find the reason for what happened. Antonella did. Read more about Online Again! 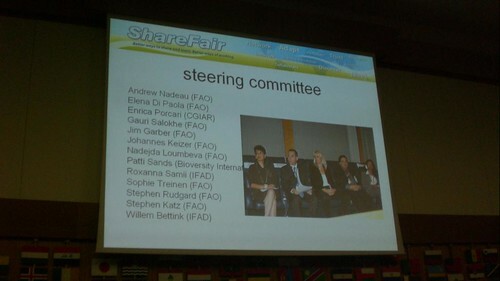 The UN based Rome agencies (FAO, IFAD, WFP) and the CGIAR organised a knowledge fair from January 21-22. This was the first of it's kind and could be considered an adventure.